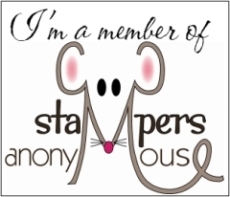 Welcome to our April Stampers Anonymous Blog Hop. You can start the hop from any team members blog and then all you need to do is follow the ‘Next Blog’ link to continue along the hop. Alternatively, there is a full list of participants below. We would love for you to leave us a comment and let us know what you think of our creations and hopefully we have inspired you to get creating too. This month we are working with the following Sketch. For this sketch I went with a simple card using the lovely Animal Expedition Suite on pages 26 & 27 of the Annual Catalogue. One of the great things I love about this set is that not only does it have coordinating dies for the stamp set but the dies also fit the designer series paper images. The image on my card is actually from the designer series paper which makes for a super quick card. I hope I have inspired you with my creations. You will find a supply list below along with a full list of the hop participants, but for now you can head over to the next blog or back to the previous one by clicking the buttons. It’s time for another Stampers Anonymous Team Blog Hop and this time we are creating using Sale-A-Bration items. Sale-A-Bration ends on 31st March so if you don’t have all the FREE items that you wanted yet don’t forget to place an order before then so you don’t miss out. Hopefully we will provide you with some inspiration for the items you already have or those you may still want. I’m creating a quick & simple card today using the Hello Cupcake stamp set and co-ordinating dies. There is a limited time release (just for March) on co-ordinating framelits for some of the Sale-A-Bration stamp sets. To purchase any of the items I’ve used you can go to my Online Shop or click the links below. It’s time for another Stampers Anonymous Team Blog Hop and this time we have a Colour Challenge. I have mixed a couple of stamp sets together for this one. I’ve used Butterfly Gala, Beauty Abounds & Amazing Life all from the Occasions Catalogue. Here’s my creations. I’ve managed to use all 5 gorgeous colours. You can make your way around the hop using the buttons. To purchase any of the items I’ve used in my creation you can go directly to my Online Store or contact me to place an order either via email or call 0418218467. It’s time for another Stampers Anonymous Blog Hop and this time we are showcasing some new stamps from the upcoming Occasions Catalogue which will be released on the 3rd January. Those participating could choose from these 2 stamp sets which we received at our last Demonstrator event. I’ve chosen to use Incredible Like You and create a ‘simple card’ using just ‘stamps, paper & ink’ and a few dimensionals. To purchase any of the items that I’ve used in my creation and are currently available just click the item below and it will take you directly to my Online Shop. The stamp set will be available from 3rd January, 2019. Stampin’ Up! are getting in on the Black Friday sales too with a 10% off all Annual Catalogue items over the next 6 days. Each 2 day period will offer certain items at the discount and must be ordered during these 2 days. When the next items come on sale you can no longer purchase the previous items. What’s on sale on what days? Bags, Brads and Buttons, Cards and Envelopes, Cardstock, Designer Series Paper, Embossing material, Glitter, Ribbons, Twine, Specialty Paper, Tags & Washi Tape. Stamp sets (clear-mount, wood-mount and photopolymer), Project kits, Card kits, Kit refills, Memories & More & Punch box kits. You can place your order via my Online Shop. email me or phone 0418 218 467 and I’ll place your order for you. When ordering Online from 23rd November till 30th November please use Hostess Code RQ3E3ZSY to receive a little something extra in the mail from me.